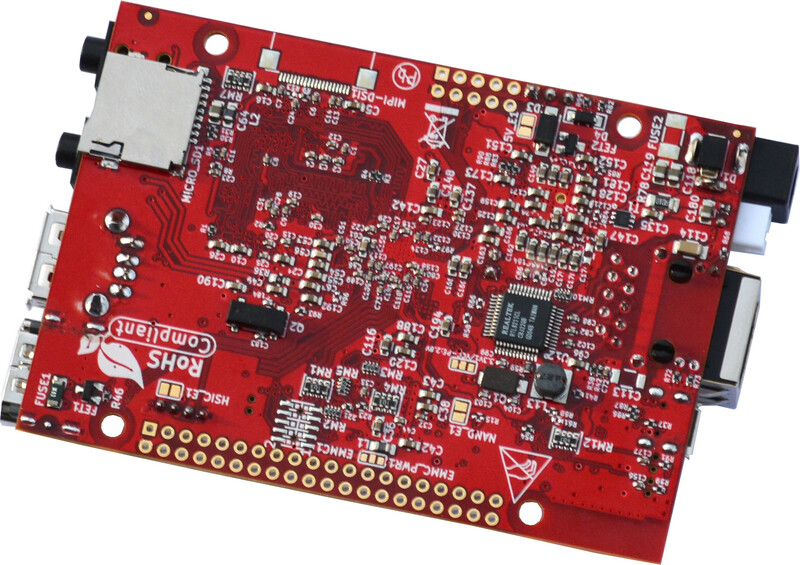 A64-OLinuXino 64-bit ARM OSHW designed completely with KiCAD is live! 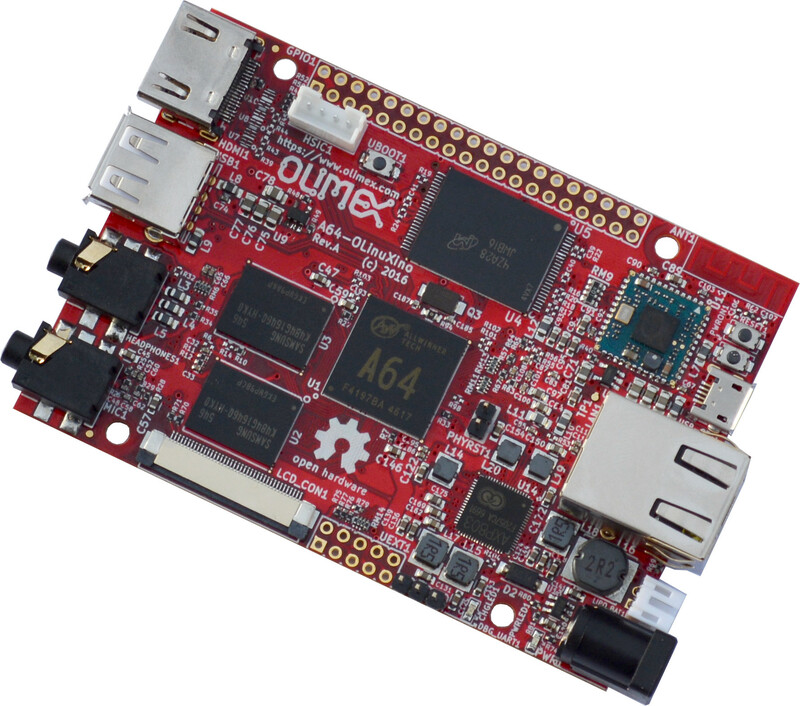 This is the first prototype of A64-OLinuXino. The first complex board we made completely with KiCAD. You can see on the picture above the full configuration with 1GB RAM (2GB is possible) and 4GB fast SLC eMMC Flash, with WiFi+BLE4.0 module. It was a while until we found free window to run it on the assembly line, but this week we succeed. Android is build and run from the Allwinner SDK, Dimitar Gamishev managed to make some quick and dirty Linux image, based on Allwinner uboot and kernel, but things are far from complete. The good news is that A64-OLinuXino boots fine, here is meminfo and cpuinfo. The bottom line – KiCAD is tested and can produce working complex boards with controlled impedance. Awesome work! Can’t wait to get my hands on it (and show to the folks here at the Taipei Hackerspace). Been making all my electronics boards (trivial ones) with KiCad, and love seeing this! Just don’t use a metal screw in the hole next to the WiFi antenna. Still the barrel connector. Why not MicroUSB? I have plenty of MicroUSB cables in my bag, I can’t say the same for those barrel connectors. Rpi, BananaPi and others all use MicroUSB for PSU, very handy. About “4GB fast SLC eMMC Flash”. What kind of mmc clock frequency and voltage is used to drive it? Congratulations! I look forward to placing an order when these are in production. This board looks amazing. I would __love__ if you guys made a version that includes at least one SATA port. It would enable so many more applications! In the meantime, keep up the great work! Hi, i’m a university student in korea. using this board’s schematic, i delete some component(eth,flash..etc) ,and add a csi camera jack.if you don’t mind, could you check this out? i attached the schematics to support@olimex.com . I took a short look onto the boardfiles, and have to say, you should improve the footprints which are using oval holes like “PWR1” and “USB-OTG1”. KiCAD supports oval holes (not only for the outer shape), which would result in a cleaner look and probably also better manufacturing process of such pads. Compared to your workaround using overlapping holes. But Eagle is commercial. The obvious next step would be to go open source all the way: design using KiCAD and simulate using OpenEMS. So when you say you’ve used KiCAD for impedance-controlled lines, this sounds interesting to me. Could you tell us more about the design flow? Did you simulate the pcb antenna? In general, what would you need to design impedance-controlled boards using only open source software? this is interesting, thanks for sharing, hopefully this EMS is close to real world. The design flow is pretty simple – you see what line impedance you need for your design in our case 50 90 and 100 ohm, then calculate what PCB stackup will give you these values and for what line width/spaces you get them, then you layout your PCB with these settings. Basically you can do this with any CAD product all you have to do is to keep lines width/spaces in the calculated values. Then you tell your PCB manufacturers which lines what impedance should have and they try to keep them in +-10% tolerances when make your boards. Are you going to release a som module too? Please update the release date.